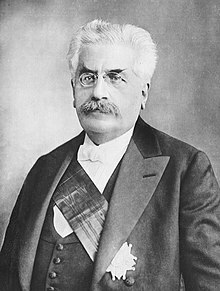 Alexandre Millerand (French: [alɛksɑ̃dʁ milʁɑ̃]; 10 February 1859 – 7 April 1943) was a French politician and freemason. He was Prime Minister of France from 20 January to 23 September 1920 and President of France from 23 September 1920 to 11 June 1924. His participation in Waldeck-Rousseau's cabinet at the start of the 20th century, alongside the Marquis de Galliffet who had directed the repression of the 1871 Paris Commune, sparked a debate in the French Section of the Workers' International (SFIO) and in the Second International about the participation of socialists in "bourgeois governments". Born in Paris, he was educated for the Bar and was elected Secrétaire of the Conférence du Barreau de Paris. He made his reputation through his defence, in company with Georges Laguerre, of Ernest Roche and Duc-Quercy, the instigators of the strike at Decazeville in 1883. He then took Laguerre's place on Georges Clemenceau's newspaper, La Justice. He was elected to the Chamber of Deputies for the Seine département in 1885 as a Radical Socialist. He was associated with Clemenceau and Camille Pelletan as an arbitrator in the Carmaux strike (1892). He had long had the ear of the Chamber in matters of social legislation, and after the Panama scandals had discredited so many politicians, his influence grew. He was chief of the Independent Socialist faction, a group which then mustered sixty members, and edited until 1896 their organ in the press, La Petite République. His programme included the collective ownership of the means of production and the international association of labour. However, when in June 1899 he entered Pierre Waldeck-Rousseau's cabinet of "republican defence" as Minister of Commerce, he limited himself to practical reforms, devoting his attention to the improvement of the merchant marine, to the development of trade, of technical education, of the postal system, and to the amelioration of the conditions of labour. Labour questions were entrusted to a separate department, the Direction du Travail, and the pension and insurance office was also raised to the status of a "direction". As labour minister, Millerand was responsible for the introduction of a wide range of reforms, including the reduction in the maximum workday from 11 to 10 hours in 1904, the introduction of an 8-hour workday for postal employees, the prescribing of maximum hours and minimum wages for all work undertaken by public authorities, the bringing of workers' representatives into the Conseil supérieur de travail, the establishment of arbitration tribunals and inspectors of labour, and the creation of a labour section inside his Ministry of Commerce to tackle the problem of social insurance. The introduction of trade union representatives on the Supreme Labour Council, the organisation of local labour councils, and instructions to factory inspectors to put themselves in communication with the councils of the trade unions were valuable concessions to labour. He further secured the rigorous application of earlier laws devised for the protection of the working class. His name was especially associated with a project for the establishment of old age pensions, which became law in 1905. In 1898, he became editor of La Lanterne. He had not joined his independent socialist colleague, Jean Jaurès, in forming the Parti Socialiste Français in 1902, instead forming the small Independent Socialist Party in 1907 which became the Republican-Socialist Party (PRS) in 1911. His influence with the far left had already declined, for it was said that his departure from the true Marxist tradition had disintegrated the movement. He continued to move to the right, being appointed Prime Minister by the conservative President, Paul Deschanel. During his time as Prime Minister, a decree of February 1920 introduced the eight-hour day for seamen. When Deschanel had to resign later that year due to his mental disorder, Millerand emerged as a compromise candidate for President between the Bloc National and the remnants of the Bloc des gauches. Millerand appointed Georges Leygues, a politician with a long career of ministerial office, as Prime Minister and attempted to strengthen the executive powers of the Presidency. This move was resisted in the Chamber of Deputies and the French Senate, and Millerand was forced to appoint a stronger figure, Aristide Briand. Briand's appointment was welcomed by both left and right, although the Socialists and the left wing of the Radical Party did not join his government. However, Millerand dismissed Briand after just a year, and appointed the conservative republican, Raymond Poincaré. Millerand was accused of favouring conservatives in spite of the traditional neutrality of French Presidents and the composition of the legislature. On 14 July 1922, Millerand escaped an assassination attempt by Gustave Bouvet, a young French anarchist. Two years later, Millerand resigned in the face of growing conflict between the elected legislature and the office of the President, following the victory of the Cartel des Gauches. Gaston Doumergue, who was the president of the Senate at the time, was chosen to replace Millerand. Alexandre Millerand died in 1943 at Versailles, and was interred in the Passy Cemetery. Portrait of Alexandre Millerand, 1921. Alexandre Millerand as Minister of War, 1914. Young Alexandre Millerand in 1893. Jeanne Millerand, née Jeanne Levayer. ^ Initiated in ""L'Amitiée Lodge"" on may 21st of 1883 (Histoire de la Franc-maçonnerie en France - Faucher and Ricker 1967). his speeches between 1899 and 1907 were published in 1907 as Travail et travailleurs. Wikimedia Commons has media related to Alexandre Millerand. "Millerand, Alexandre" . New International Encyclopedia. 1905. "Millerand, Alexandre" . Encyclopædia Britannica (12th ed.). 1922. Georges Eugène Benjamin Clemenceau was a French politician who was Prime Minister of France during the First World War. A leading independent Radical, he played a central role in the politics of the French Third Republic. Pierre Marie René Ernest Waldeck-Rousseau was a French Republican politician, who served as the 29th Prime Minister of France. Théophile Delcassé was a French statesman and foreign minister 1898-1905. He is best known for his hatred of Germany and efforts to secure alliances with Russia and Britain that became the Entente Cordiale. He was a radical and protege of Léon Gambetta. Émile Justin Louis Combes was a French statesman and freemason who led the Bloc des gauches's cabinet from June 1902 – January 1905. Aristide Briand was a French statesman who served eleven terms as Prime Minister of France during the French Third Republic. He is mainly remembered for his focus on international issues and reconciliation politics during the interwar period (1918–1939). Camille Chautemps was a French Radical politician of the Third Republic, three times President of the Council. Pierre-Paul-Henri-Gaston Doumergue was a French politician of the Third Republic. Augustin Alfred Joseph Paul-Boncour was a French politician and diplomat of the Third Republic. He was a member of the Republican-Socialist Party (PRS) and served as Prime Minister of France from December 1932 to January 1933. He also served in a number of other government positions during the 1930s and as a Permanent Delegate to the League of Nations in 1936 during his tenure as Minister of State. Jean Raphaël Adrien René Viviani was a French politician of the Third Republic, who served as Prime Minister for the first year of World War I. He was born in Sidi Bel Abbès, in French Algeria. In France he sought to protect the rights of socialists and trade union workers. Jean Marie Ferdinand Sarrien (French: [fɛʁdinɑ̃ saʁjɛ̃]; was a French politician of the Third Republic. He was born in Bourbon-Lancy, Saône-et-Loire and died in Paris. He headed a cabinet supported by the Bloc des gauches parliamentary majority. Gaston Alexandre Auguste, Marquis de Galliffet, Prince de Martigues, was a French general, best known for having taken part in the repression of the 1871 Paris Commune. He was Minister of War in Waldeck-Rousseau's cabinet at the turn of the century, which caused a controversy in the socialist movement, since independent socialist Alexandre Millerand also took part in the same government, and was thus side by side with the Fusilleur de la Commune. The 1902 general election was held on 27 April and 11 May 1902. Raoul Adolphe Péret was a French lawyer and politician. Alexandre-Félix-Joseph Ribot was a French politician, four times Prime Minister.